Divorce stirs up high emotions and intense conflict between many couples, sometimes resulting in violent and harassing behavior. These tensions can become even greater when divorcing spouses must see one another on a regular basis. New Jersey law provides protection to victims of harassment or abuse in the form of temporary and final restraining orders. That said, courts will also protect the rights of the accused by requiring that accusers provide a substantial basis and evidence to support claims of abuse before a restraining order will be imposed. In a recent case titled L.S. v. P.S., the New Jersey Appellate Division ruled that a final restraining order was appropriate where a spouse broke into his estranged spouse’s locked room and destroyed her property in what the court considered an effort to intimidate the woman. The husband at the center of the L.S. v. P.S. case had told his wife that he wished to separate in December of 2014. He remained in the marital home, but moved into another room. His wife then installed a cable lock on her bedroom. In February of 2015, the couple got into an argument over school tuition, during which the husband threw and shattered a glass pitcher. The wife left the home, taking their children. While the wife was gone, the husband shattered additional glasses, broke into his wife’s locked room, and destroyed more property, while also sending harassing texts to his wife. When the wife returned to discover the damage, she contacted police and filed a domestic violence complaint against her husband and also obtained a temporary restraining order. The woman filed for a final restraining order and presented a police report and the officer’s photos of the damaged property as supporting evidence. The husband’s account of the day’s events were not different in substance from the wife’s, but he argued that breaking marital property and sending harassing texts did not constitute harassment under New Jersey law, and that a final restraining order wasn’t warranted. The restraining order was granted, and the husband appealed. Under New Jersey’s Prevention of Domestic Violence Act, courts may grant final restraining orders only where the accused has committed an act defined as one constituting a form of harassment or domestic violence, and the court believes the restraining order is necessary to protect the victim from additional abuse. In order to qualify as harassment, behavior must be part of a course of conduct by the accused, intended to “alarm or seriously annoy” another person. Here, the opinion noted that even though the harassing behaviors occurred over the course of one day, they constituted a course of conduct and were intended to “control” and “manipulate” the wife. The Appellate Division also concluded that the husband had committed “criminal mischief” which supported the existence of the FRO. Under New Jersey law, “criminal mischief” is defined as “purposely or knowingly damag[ing] tangible property of another.” The husband argued that the property he broke was marital property and as such couldn’t be considered the wife’s property. The Appellate Division rejected this argument, noting that, in cases where one spouse breaks marital property, each spouse’s interest in jointly-owned marital property is considered independent from the other’s. In other words, even though the husband may have had some legal ownership rights in that property, he did not have free reign to destroy the property, since his wife also owned it. 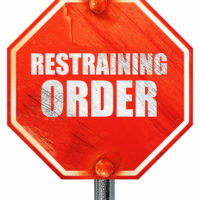 If you have been the victim of harassing behavior by a former spouse or partner and want to protect your and your loved ones’ safety with a restraining order, contact the knowledgeable, compassionate, and effective Union family law attorney John B. D’Alessandro for a consultation on your case, at 908-964-0102.